Wednesday June 6th 1923 Edith went away today. The train was very late. I rode to town with Mrs Dunlap at 10.30 to take treatment of Dr Stayher. Did some errands and came home with Cora & Fannie. Hattie stayed till Edith left was busy with my own affairs in afternoon. 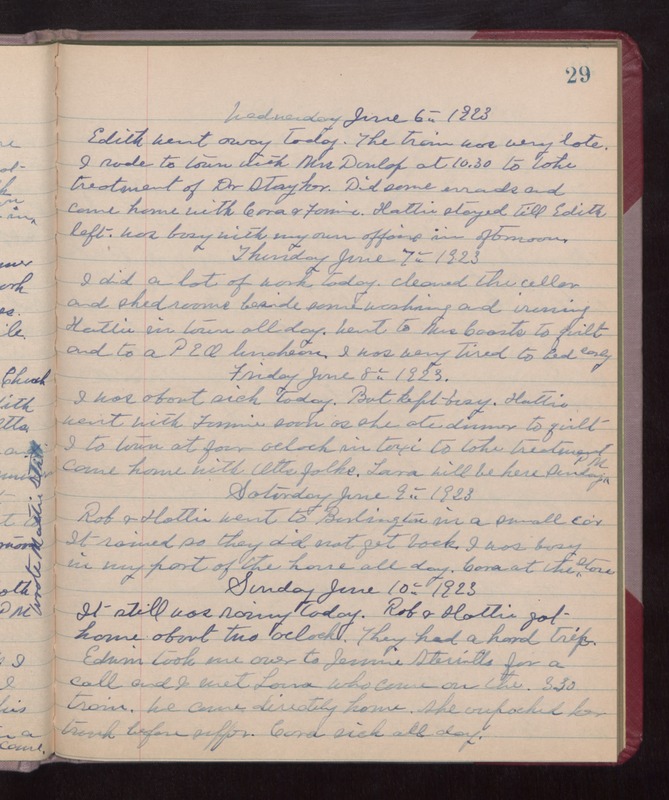 Thursday June 7th 1923 I did a lot of work today. Cleaned the cellar and she rooms besides some washing and ironing. Hattie in town all day. Went to Mrs Coasts to quilt and to a P E O luncheon. I was very tired to bed early. Friday June 8th 1923 I was about sick today. But kept busy. Hattie went with Fannie soon as she ate dinner to quilt. I to town at four oclock in taxi to take treatment. Came home with Otts folks. Laura will be here Sunday PM. Saturday June 9th 1923 Rob & Hattie went to Burlington in a small car. It rained so they did not get back. I was busy in my part of the house all day. Cora at the store. Sunday June 10th 1923 It still was rainy today. Rob & Hattie got home about two oclock. They had a hard trip. Edwin took me over to Jennie Sterritts for a call and I met Laura who came on the 3.30 train. We came directly home. She unpacked her trunk before supper. Cora sick all day.